If the way to his heart is through his stomach, know what would hit the spot for these guys we spotted at an ice cream launch event. We women never run out of reasons to turn to food--when we need comfort, when we're happy and in a celebratory mood, when we're stressed, etc. It's also what we love to give our men (especially when we're already stumped in the first place on what to give him). If there's one comfort (or celebratory) food that both men and women share a love for, it's got to be ice cream. Its rich, smooth, and creamy taste can miraculously take away our sorrow and stress, and highlight any joy that we already feel. It's particularly hard to resist ice cream when it comes in luscious, sinfully delicious flavors like those of Nestle's newly-launched Heaven. Comfort food just got more heavenly with the introduction of the line's four new ice cream flavors: Butter Pecan Obsession, Belgian Chocolate Bliss, Vanilla Almond Secret, and Strawberry Dream. Just reading their names is enough to make you want to run to the nearest grocery to buy yourself a pint! 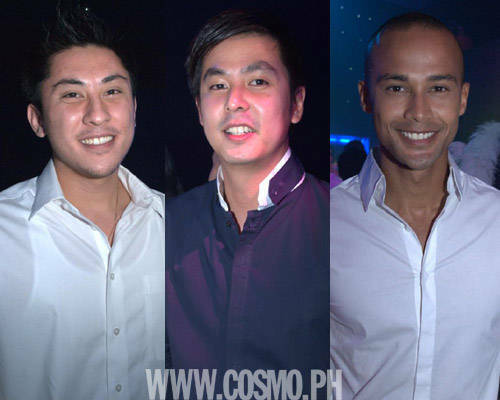 At Heaven's launch event recently held at A.Venue Events Hall in Makati (complete with angels, one of which even "flew" above all the guests), we spotted heavenly-looking men among the ice-cream-loving revelers--one of them is ultimate hunk Will Devaughn. Since everyone was in the mood for great comfort food (free-flowing Heaven ice cream, of course! ), we asked these guys: What food would you like your girl to surprise you with? Launch our gallery and read their answers carefully, so you know what treat to give your guy next time (or know what would win that new guy over)!